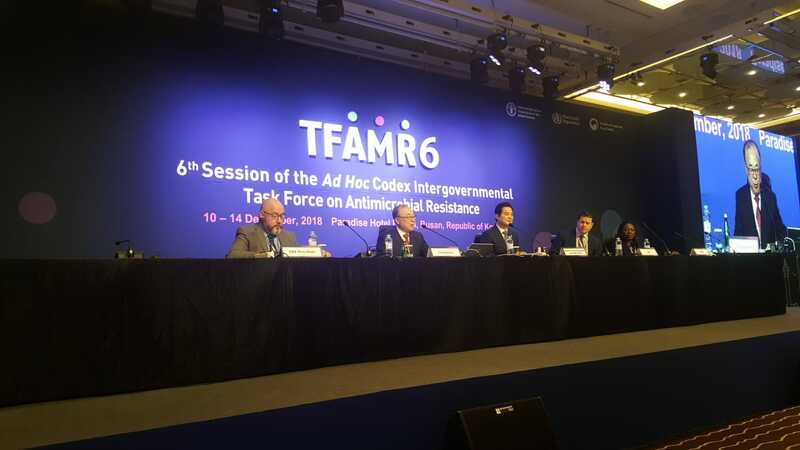 The Ad hoc Codex Intergovernmental Task Force on Antimicrobial Resistance (TFAMR) started its sixth week-long meeting today in Busan, Republic of Korea. With more than 250 Codex Members and Observers in attendance, the meeting will make progress on revising the Codex Code of Practice to Minimize and Contain Foodborne Antimicrobial Resistance as well as developing the Guidelines on Integrated Surveillance of Antimicrobial Resistance. "The problem seems simple”, said Dr Yong Ho Park, the TFAMR Chair, underscoring the rapid increase of microorganisms developing an ability to defeat the drugs designed to kill them. “However, the solution is not simple. AMR is a complicated challenge impacting human and animal health and the environment". With these words, the Chair set the stage for the challenging week ahead to develop science-based guidance to managing foodborne AMR. The discussion will include consideration of the definitions of the terms to use in the texts, as well as the scope, such as how to consider foods of plant origin and how to optimally convey a progressive approach when it comes to AMR surveillance and management. Since the last meeting of the Task Force on AMR in November 2017, two electronic working group meetings have been held: one on the guidelines and the other on the code of practice, both of which kicked off in January 2018. The Task Force has recently received scientific advice from FAO and WHO in collaboration with the World Organisation for Animal Health (OIE). The Organizations issued a summary report on the role of the environment, crops and biocides in foodborne AMR. In 2017, the Task Force was charged with developing science-based guidance on the management of foodborne antimicrobial resistance, taking full account of the WHO Global Action Plan on Antimicrobial Resistance, in particular objectives 3 and 4, the work and standards of relevant international organizations, such as FAO, WHO and OIE, and the One-Health approach, to ensure that Members have the necessary guidance to enable coherent management of antimicrobial resistance along the food chain. Antimicrobial resistance continues to be a high priority for the global community. The UN Interagency Coordination Group on Antimicrobial Resistance, whose secretariat is hosted by WHO in collaboration with FAO and OIE, is preparing recommendations for the approaches needed to ensure sustained effective global action to address antimicrobial resistance, which will be submitted to the UN Secretary-General in mid-2019.